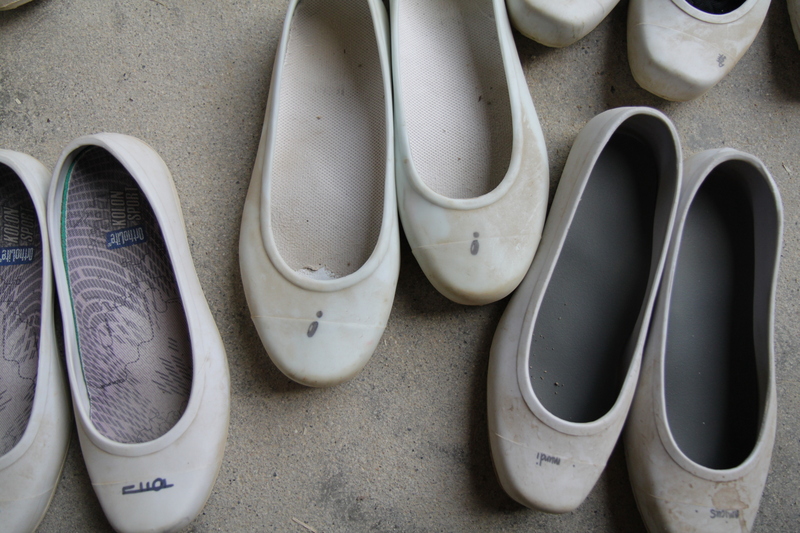 Shoes and Paddy, South Chung-jeong Province, Seocheon. In the Hua-yen universe, where everything interpenetrates in identity and interdependence, where everything needs everything else, what is there which is not valuable? To throw away even a single chopstick as worthless is to set up a hierarchy of values which in the end will kill us in a way which no bullet can. In the Hua-yen universe, everything counts. There are a thousand hacking at the branches of evil to one who is striking at the root, and it may be that he who bestows the largest amount of time and money on the needy is doing the most be his mode of life to produce that misery which he strives in vain to relieve. To everyone who has left comments here during the past couple months, thank you: I’ve read them all but haven’t had time to reply. Housekeeping matters here, especially concerning resizing the photos in old entries to accommodate the new template (which is also begging the question, to keep or not?, at present) are in a woeful, neglected state. In about a week or so, my class will finish Cheng-kuan’s lengthy introductory commentary to the Avatamsaka Sutra and finally enter the Sutra proper itself. Hua-yen, or in the Korean pronunciation, Hwa-eom Buddhism is a specific aspect of Chinese Buddhist thought and history that I’ve had to approach in Western literature mostly from side-paths. With the exception of three books on Hua-yen Buddhism in English–one by CC Chang, one by T. Cleary, and the last by Francis Cook–it’s easier to find extensive resources on the various components that are drawn together in the great network of Hua-yen though: Yogacara, Tathagatagarbha, Chinese influences on Buddhist thought, Ch’an. In between the main thrusts of these movements and histories, Hua-yen runs like an underground stream, surfacing here and there but rarely studied in its full. I gave up on CC Chang’s book quickly. He was an notable scholar but too in awe of the Buddhist religion to reign in his prose or some of his judgements in his scholarly work. Cleary’s book I will read as I study the sutra itself (and his translation of it), since mostly focuses on translations of various treatises on the sutra by the patriarchs of the tradition. Cook’s book, however, is both accessible and well-informed, written from a perspective that both deeply esteems the Hua-yen Sutra and has spent time considering the text’s relevance to the world of cast-off shoes and human relations, the environment and society. I have a thing for the cast-off objects of the world. Not that I am a great conservator, an accomplished economist of the not-one-rice-grain-wasted school, not that I am immune to the lure of shiny new things. (I am particularly susceptible to new pens, new notebooks, new stationary pads, new books; less so to new shoes but not to new rosaries, somewhat skilled at deferring the hunger for new teacups but not above pestering a friend to give me one as a present or shamelessly admiring a handsome coffee mug. I am a consumer trying to undermine her own habits, and only partially successful.) But I am nonetheless concerned with what has been cast off, curious about their new existences after their initial and obvious function has been set aside. 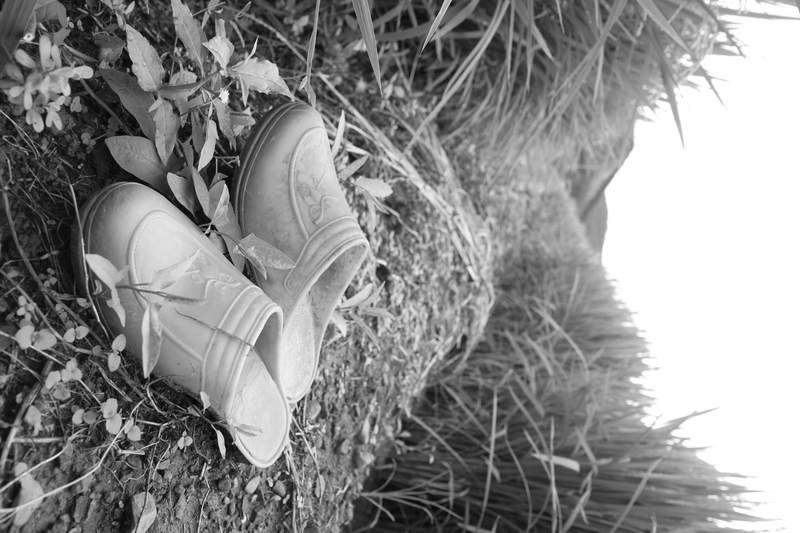 These shoes were waiting just thus on the embankment of a paddy in South Chung-jeong Province last August. Are they truly cast off? I don’t know. Perhaps they’re just resting, until the farmer returns to the paddy to work. This curiosity, at first aesthetic, takes on a new importance in the light of the Avatamsaka Sutra. Although I didn’t chose to include Walden on my summer extracurricular reading list because I knew that Thoreau would speak so directly, from his own experience and view, to some of Hua-yen’s most central messages to us in the physical, mundane world, Thoreau is becoming an excellent companion. In a world where everything needs everything else, our modes of life are not individual choices without consequence, nor are our mistakes, made in ignorance or greed or even misguided goodheartedness, easily bartered away with an action of the opposite apparent value. The implication being, as I experience it in my own life, that we cannot pay the price of a cast-off pair of shoes by recycling several cola bottles. We cannot save the soul we lost in a moment of anger by loving the one we struck the next moment. Does this make our acts of contrition and repentance meaningless? No; but those acts don’t erase the past so much as guide the future. The first lesson of anger isn’t to love, it’s to not get angry. And the first lesson of casting off is not to recycle elsewhere, it is to understand that nothing is ever thrown away and forgotten, but remains, in a new form and function, continuing to affect us and be affected by us, in a world where everything needs everything else.